Hargeisa -(warsoor) – Innovate Ventures (www.Innovate.so), the leading Somali tech and business startup accelerator launched in partnership with VC4A (https://VC4A.com), Telesom (www.Telesom.net) and the Work in Progress! Alliance, had their second cohort of 10 startups from Somaliland and Somalia graduate from their programme. This year’s accelerator saw over 400 applications received, building on the traction of last year’s programme. The seed investment given doubled from $15,000 last year to $30,000. Programme Overview The Innovate Accelerator is a 12-week programme intended to support and fund the next wave of Somali startups. Mentorship and training was provided by domain experts and entrepreneurs and four startups from the programme received $30,000 in investment from Innovate Ventures Fund. Growth The accelerator programme reached more than 2 million people via SMS and TV coverage of the roadshows and Demo Day in Somaliland, Somalia and the UK and US. The significant increase in applications and seed investment, and further support and interest from the private and public sector has seen the reach and attention of the accelerator grow. Demo Day On Sunday, October 29th at Mansoor Hotel, the Demo Day took place, which was the culmination of a 6-month programme to find startups who could create value, jobs and had the potential to scale. The event saw more than 300 participants attend along with media, entrepreneurs and investors. Each team pitched their startup to a panel comprising of entrepreneurs, c-level executives and business owners. Looking Forward Warda Dirir, Co-Founder of Innovate Ventures, comments, ‘the success of this year’s accelerator programme is down to years of ground work in the region and lessons learned. We are committed to helping the region produce more technology driven businesses that resolve business challenges in the region and tap into untapped markets’. Given the growth of the programme, more applicants and larger investments are expected next year, giving the burgeoning Somali tech startup scene further support. 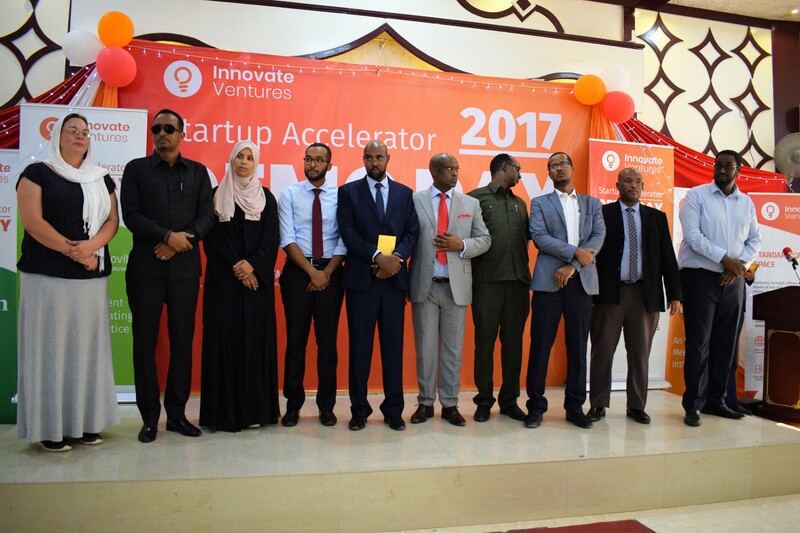 About Innovate Ventures: Innovate Ventures (www.Innovate.so) is the leading startup accelerator and technology fund in Somaliland and Somalia. Innovate Ventures was created to propel and accelerate technology startups in Somalia and Somaliland, support the next wave of Somali entrepreneurs, and grow the nascent startup ecosystem in the country. Innovate Ventures have run coding camps, incubators and accelerators in the Somali region since 2012. About VC4A: VC4A (https://VC4A.com) is a startup funding platform and a network of entrepreneurs, angel investors, venture capitalists and mentors building game changing companies on the African continent. VC4A supports the growth of Africa’s startup ecosystem by connecting startups to both hard and soft capital through online platform, promoting the culture of angel investment and providing technical support to local accelerators. About Work In Progress! Alliance: The goal of “Work in Progress!” is to improve the economic prospects of young men and women in Egypt, Nigeria and Somalia, create jobs and stimulate entrepreneurship by improving the skills of young people, strengthening small and medium enterprises (SMEs) and creating an enabling environment. Alliance partners include Oxfam, VC4Africa and Butterfly Works. About Telesom Company: Telesom (www.Telesom.net) is the largest telecommunications company headquartered in Hargeisa, Somaliland. Telesom provides a variety of mobile communication products and services. It offers prepaid call plans, monthly subscription plans, International Roaming, MMS, WAP (over both GSM and GPRS), residential fixed line services, and broadband internet plans.